I’ve never kept track of how many times I’ve read Todd Boss’ collection, Yellowrocket, but it’s one of very few recent collections that I’ve returned to. Only Kevin Young and Natasha Trethewey have stuck with me as much as Boss has. Yellowrocket is Boss’ first complete collection. Boss’ career has been a slow burn, but has exploded in the last few years and will only continue to heat up. He’s a poet to watch in the coming years, so start with this collection, and On Marriage, and you’ll be up to date when his next collection, PITCH, is published in February. You already know of my obsession with letterpress and poetry (together and separate). You might already know about my interest in collaborative writing, from this What We’re Reading post and related interview. 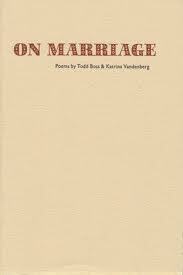 On Marriage, a collaborative chapbook of poems between Todd Boss and Katrina Vandenberg combines all of these things into one irresistible package. Writing collaboratively, like marriage, is a joint effort. If both sides don’t listen to the other, it shows. Here, the poems seem effortless, and flow easily from one to another. The pages are full of humor, colloquial language, bare moments of honesty, and a bit of love. Different from Zachary Schomburg and Emily Kendal Frey, these poems weren’t written together, one by one. Rather, the poets stick to what they’re best at, and go back and forth, resulting in a conversation between two individuals rather than a complete melding of personalities. I don’t have a preference to either, as long as they do it well—it’s just a matter of different approaches. Here, it’s done exceptionally well. on the next step up. Slim hips pulled in. *Did you miss our interview with Todd Boss? Check it out here! On Marriage sounds like a fantastic collection and a great thing for writers to do. I will definitely be checking it out.